Virgin Racing have been struggling to keep pace with other Formula One teams this season. New Formula One team Virgin are granted permission to enlarge fuel tank. The team discovered that their tank could be too small to complete some races. McLaren drivers Lewis Hamilton and Jenson Button set the pace in practise for the Australian Grand Prix. Hamilton's road car impounded for driving in an 'over-exuberant' manner. (CNN) -- Formula One debutants Virgin Racing have been granted permission to increase the size of their fuel tank after finding out that it is too small to get to the end of some races. Motorsport's governing body, the FIA, said Virgin would be permitted to make the modifications to their car on reliability grounds. New rules introduced this season prohibit cars from refuelling during the race. Virgin's re-vamped car will not be ready until the Spanish Grand Prix in May, the fifth race of the 2010 season. "It has become clear during pre-season testing and our debut race in Bahrain that our fuel tank capacity is marginal and if not addressed there is the possibility that fuel pick-up could become an issue in certain circumstances," Virgin technical director Nick Wirth said in a statement on the sport's official Web site formula1.com. "We thank the FIA for permitting this change. At the time the design of the tank was locked down in June 2009, its capacity was determined by a number of factors, some of which have since changed, and the tank capacity now needs to be increased accordingly." 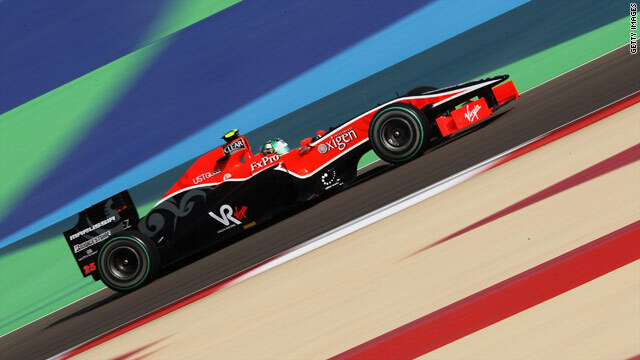 Along with fellow new boys Hispania Racing, Virgin's drivers have been off the pace so far this season, with both cars retiring from the season-opening Bahrain Grand Prix by the 16th lap. In Friday's second practice session for the March 28 Australia Grand Prix, the cars suffered technical problems, including a gearbox leakage and telemetry problems, with Timo Glock the slowest of all the drivers who completed a lap and Lucas di Grassi failing to post a time. The McLarens of Lewis Hamilton and Jenson Button made the running in Melbourne with 2008 world champion Hamilton posting the fastest time of 1 minute, 25.801 seconds. Reigning champion Button was 0.275 secs slower, with Red Bull's Mark Webber third and Michael Schumacher's Mercedes fourth. The Ferraris of Fernando Alonso and Felipe Massa, who finished first and second in Bahrain, were 15th and 17th respectively as they focused on race preparation with a heavy fuel load ahead of speed. Meanwhile, Hamilton has apologized after his Mercedes road car was impounded by Melbourne police. Hamilton was pulled over by police near the Albert Park circuit on Thursday evening, the UK Press Association reported. "This evening, I was driving in an over-exuberant manner and, as a result, was stopped by the police," Hamilton said in a statement released by McLaren.